Yesterday someone on Twitter said that “lime jello + orange jello = awesome” and this statement instantly lighted up the part of my brain storing the memory of Jell-O 1-2-3. Jell-O 1-2-3 was a triple-layered product that had normal Jell-O on the bottom, a foamy layer on the top, and the most scrumptious, creamy, mixture of the other two layers sandwiched in the middle. 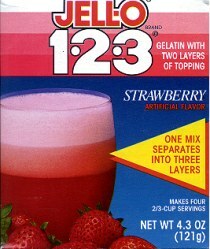 The product was discontinued in 1996, which means Jell-O 1-2-3 has not been available since before I could drive (legally). I googled around and quickly found a hack recipe for Jell-O 1-2-3 at the Kraft Foods site. (They must get asked about it a lot.) It seemed simple enough, so I tried making it last night. Here is the recipe followed by my experience. DISSOLVE dry gelatin mix in boiling water in bowl. Add enough ice cubes to cold water to measure 1-1/4 cups; add to gelatin mixture. 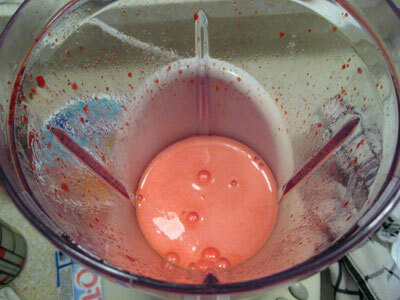 Add to blender; cover and blend 30 sec. ADD whipped topping; cover. Blend until smooth. POUR evenly into 4 dessert dishes. Refrigerate at least 20 min. or until set. Store leftover dessert in refrigerator. Before anyone asks, yes, I know the smoothie spout on my blender is upside down. Don’t worry, gravity is still working as normal in my house (as Java Bean has been carefully monitoring). The blender is old and I have to turn the spout that way to seal it completely. A cap came with the blender as an alternative to the smoothie spout, but was lost in a move when a family member found it and said, “Huh, a bottle cap. Don’t need this!” and threw it in the trash. And before anyone else asks, traditionally sized bottle caps do not fit the spout. I’ve tried. Thus, I use an upside down spout, until I buy a new blender, probably this week, because this one leaked red Jell-O mix out the bottom and looked like it was BLEEDING all over the counter. Uh, right, so where was I? I mixed boiling water and Jell-O mix in the blender, which was a lot more fun than just stirring it with a spoon like I normally do. At this point, it wasn’t very frothy yet. I mixed in the cold water and ice, and then I added the magic ingredient: Cool Whip. This was the hardest part of the recipe for me because I love few things more than eating whipped cream straight out of the tub. I wish they sold whipped cream in smaller containers, because I usually end up eating a whole box in a day. It’s one of those foods I don’t let myself buy often because I can’t control myself around it. Not so much Jell-O 1-2-3 and Jell-O 1…3. I got a gradient of textures instead of three distinct layers. I’m not sure if I added too much whipped cream, if I blended for too long or too little, or if the temperature of my water was off. 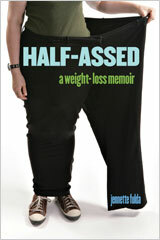 This blogger’s attempt came out better than mine as did this lady’s. However, it was still tasty, pretty damn low-calorie, and brought back happy memories. 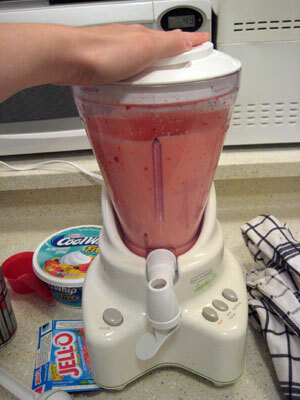 I’ll probably try it again as soon as I buy a blender that doesn’t leave my counter looking like an ER. I’ve never heard of Jell-O 1-2-3, but this post makes me wish I had. I LOVE CoolWhip. Freeze it, then eat it like ice cream! Somehow I missed Jello 123. It looks like fun! 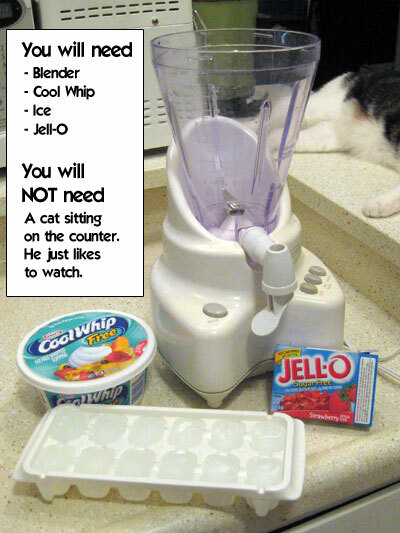 I’ll have to try it when I get a new blender, as mine is also extremely old and I am afraid the ice cubes would kill it. My grandmother could make amazing things with jello. She made a “cheesecake” with lemon jello, and a lime pie with lime jello, and all sorts of fruit salads. I love how easily the recipes can be made sugar-free, although my grandmother never made them that way! @Gwendolyn – Well if you do, send it to me! Ah yes, I’ve had the trio treats before, they’re quite tasty. Thanks for linking that, as I couldn’t remember what it was called. I got lost in my blender envy. I SO covet your spout—upside down or right side up. I’m British and we have trifle mix which sounds really similar to this. Try looking for that? If you can’t find it in stores over there you can get it online. What phase/s of SBD does this work with? Forget the jello! It’s the cat lying on the counter that got my attention. Reminder to myself: get yourself a cat. Preferably two! OMG, I remember that Jell-o 123! Personally, I loathe strawberry-flavored anything (except real strawberries) but I remember many 123 desserts in my childhood. I made this cappuccino parfait from a recipe on a cool whip container, and it was actually really good! I found a recipe for it online, but it doesn’t show a picture. 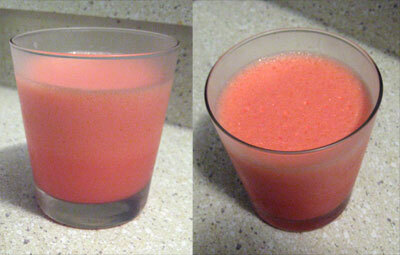 It looks very pretty layered in a fancy glass. @Marla – Mmm, that sounds good. I’ll have to try it. Which means I’ll have to buy more Cool Whip. Oh, noes! @Just Kelly – Uh, I don’t know. I think it would work with phase 1. This reminded me of Dream Whip – I think they still sell that. I bet if you used Dream Whip instead of Cool Whip it might separate out better…. (you can find Dream Whip on http://www.practicallyedible.com). Man, today’s processed food is just as crazy and high tech, but I think they hide it better. All natural flavors! No preservatives! So, I’m confused, does the jello just separate into layers by itself? That’s seems kind of deliciously disgusting. @lila – Yeah, it separates on its own. We never had 1-2-3 Jello. But we also never had Happy Meals b/c my mom always said, “it’s cheaper to get just the sandwich and the fries, you don’t need another toy and we have pop at home!” So my guess is that my mom never saw the appeal of 1-2-3 Jello either. Bummer b/c it looks cool! My favorite way to use jello these days is to stir the powder into my Fage Greek 0% yogurt for flavoring. I totally forgot about that product! 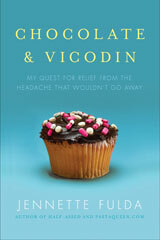 @The Better Idiot – I’m confused – doesn’t trifle always and invariably involve custard, while the jello/jelly is optional? (To me, the custard is the best thing about trifle). Just to add to the Cool- Whippiness of this post…. take a tub of Sugar-Free chocolate Cool-Whip and freeze it. Oh. My. Gawd. So good and I think it is only like 50 calories for the whole darn thing. That is my PMS medicine. Oh, my. I saw something just like this in the grocery store last week. It wasn’t a Jello brand product, but it layered like that, and I think it had 1-2-3 in the name. I’d go back to the store and look, but I’d evacuated for Ike and was hanging out with friends in Austin. I’ll look in my local grocery store the next time I get brave and leave the house. @Pamela R – ooo yum never thought of that…gunna try it! It looks like the difference between your technique and the two you linked to was that they allowed the ice to melt before blending in the cool whip. 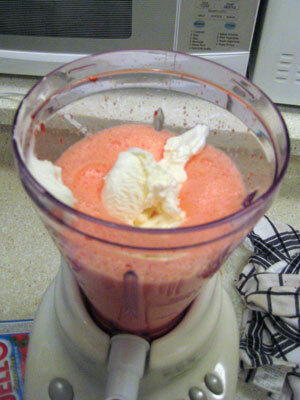 If the ice is still slushy in the blender when you add the whipped topping it can break the whipped cream and thusly not separate. Or if the liquid is still too hot from the cubes not melting all the way it will melt the topping. This recipe is on all the sugar free Jell-o boxes now as a standard recipe.